Baron J. H. W. von Schröder had one of the finest orchid collections in Europe and he loved cattleyas. The largest and grandest greenhouse on his estate near Windsor was built just for cattleyas, and his appetite for fine Cattleya species was insatiable. At The Dell, as he called his estate, he wanted only the best and nothing less would do. Baron Schröder was a good customer of the English orchid firm Sander’s Ltd., so when Sander’s orchid collector in Colombia, William Arnold, found a new cat-tleya in 1886, the first person Frederick Sander thought of was the Baron. When the newly collected plants arrived, the Baron obligingly bought most of them, and Frederick Sander sent the first flowers to the botanist H.G. Reichenbach, with the suggestion that Reichenbach describe them as a new Cattleya species. When Reichenbach procrastinated in writing the description, Sander sent more flowers and pushed Reichenbach to visit his greenhouses to see the plants. Yet Reichenbach still did nothing. Reichenbach’s description of the new plant, however, did not come out quite the way Sander had planned it. Reichenbach described the new plant as “Cattleya (trianaei) Schroederae,” so the plant was suddenly not a new species, just a new form of a previously described species, C. trianaei. Sander, however, was convinced the plant was not C. trianaei. Its bright, delicious fragrance was distinctive and different from the subtle fragrance of C. trianaei. Its petals and lip were more frilly or crisped, and it was a more vigorous grower. It also produced more flowers on a stem than C. trianaei. Sander felt it had to be a new species. Cattleya schroederae has always been considered a feminine flower. Its lovely pale lavender color is often described as “overlaid with pink pearl,” and it has a tantalizingly sweet fragrance. Reichenbach certainly thought it was feminine when he named it for the Baroness von Schröder, because he named a bold dark purple clone of Cattleya trianaei for the Baron (Cattleya trianaei schroederiana). Despite its feminine appearance, however, C. schroederae had only a limited presence as an adornment for women in the cut-flower market of the 1930s, ’40s and ’50s. Cattleya schroederae lacked the wide range of color found in C. trianaei, and yet it competed with C. trianaei for the late-February to early-March flower sales. Most clones of C. schroederae looked more or less the same and no woman wanted to look like all the other women at a dance or reception, at least not in the United States. Cattleya schroederae’s beautiful shape, however, made it the perfect model for a fine exhibition plant. Here its free-flowering nature, frilly petals and lip, and pleasing fragrance were definite assets. Cattleya schroederae produced three to five flowers on a spike, unlike C. trianaei, which had only two or three. Cattleya schroederae can have seven flowers on a spike if exceptionally well-grown, and can produce a magnificent specimen. One such plant was even pictured in June 1903’s The Orchid Review and the March 1953 American Orchid Society Bulletin. 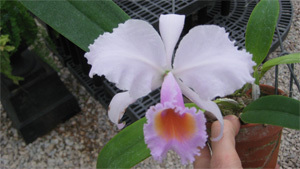 Cattleya schroederae’s excellent shape garnered it nine First Class Certificates from the Royal Horticultural Society in the first 20 years following its discovery, despite the color similarity of the various clones exhibited. R.A. Rolfe, editor of The Orchid Review, considered C. schroederae alba the finest white Cattleya in existence in 1893. The American orchid collector John Lager found C. schroederae to be the most abundant Cattleya in Colombia during his explorations there in the early 1900s. During one trip, Lager discovered two of the finest and eventually most famous clones of C. schroederae on the mountain slopes above the Casanare River. The first clone, C. schroederae ‘Hercules’, was a beautiful, round, alba form with an orange throat. It was so fine that Lager used its picture to adorn the stationery of his own orchid company, Lager & Hurrell in Summit, New Jersey. The flower was also pictured in the September issue of the first volume of the AOS Bulletin in 1932. Lager sold a division of ‘Hercules’ to a private collector and the plant eventually found its way to the English orchid firm Stuart Low, which exhibited it in 1925 in London where it received an Award of Merit from the Royal Horticultural Society. The American Orchid Society also gave ‘Hercules’ an AM in June 1932 when it was exhibited by the second president of the AOS, Fitz Eugene Dixon. The second clone Lager named C. schroederae ‘Summitensis’ for his nursery in New Jersey. This was a large blush flower with an intense reddish-orange throat and purple lip. ‘Summitensis’ had a fine round shape and was also sold to a private collector. It was was later acquired by Major George L. Holford (Sir George Holford of Westonbirt fame) who exhibited it under the name ‘The Baron’. As ‘The Baron’, it received an FCC/RHS in 1908 and, right or wrong, the clone ‘Summitensis’ has been known as ‘The Baron’, FCC/RHS, ever since. There are no dark clones of C. schroederae, but ‘Pitt’s Variety’, FCC/RHS, awarded in 1901, did have sepals and petals of a medium lilac color, and you can occasionally find a clone today, like ‘Severn’s,’ that approaches this color. The rich orange color in the throat of C. schroederae is typical for the species, and it is present in most clones. There are a few lemon-yellow and pale-yellow throats, however, in keeping with the natural color variability of any Cattleya species. Cattleya schroederae has made significant contributions to Cattleya hybridizing. Cattleya schroederae’s very pale coloring in the sepals and petals has allowed hybridizers to retain the beautiful colors of the art-shade Cattleya hybrids while improving the shape and increasing the size of these flowers. One of the earliest successful crosses was Laeliocattleya Elinor (C. schroederae x Laelia Coronet), which retained most of the brilliant reddish-yellow and bronze shades of Laelia Coronet (cinnabarina x harpophylla) while producing an acceptably shaped flower. The round shape of many large, exhibition, pale-lavender Cattleya hybrids today often comes from C. schroederae, not just C. trianaei. The biggest problems Reichenbach had in classifying C. schroederae were in its growth and flowering habits and its flowering season, which are virtually the same as a late-flowering C. trianaei. Cattleya schroederae begins growing in the spring when a late C. trianaei would, and its growth matures with C. trianaei in late summer. It then rests for several months, like C. trianaei, before sending up flowers. The pseudobulbs of C. trianaei and C. schroederae look virtually the same, and one can easily be mistaken for the other. The flowers of C. schroederae, like those of C. trianaei, are also among the longest lasting of the Cattleya species (five weeks is normal), and both C. trianaei and C. schroederae are well-known for their clones with fine, round shape. From Reichenbach’s point of view, C. schroederae seemed nothing more than a pale lavender strain of C. trianaei. One had to grow the plants for a season or two to see the differences, and Reichenbach’s friends, like Frederick Sander and Baron Schröder, did not give him the luxury to do this. It is interesting to note that during the heyday of the Cattleya as a cut flower, the rich dark-purple-colored cattleyas were the preferred flowers for corsages in Great Britain and the United States, while the pale lavender flowers, like C. schroederae, were preferred in Germany. When Reichenbach named C. schroederae for a Baroness with the German name von Schröder, he apparently knew more of what he was doing than he is often given credit for. With a delicate, pink-pearl coloring and sweet fragrance, C. schroederae is an enchanting maiden of the realm of the Cat-tleya species — a sumptuous flower that takes you from winter into springtime with the soft touch of a beautiful Baroness. CATTLEYA schroederae makes a good beginner’s plant because of its ease of culture. It will start growing in early spring in most of the United States and, like C. trianaei, will complete a growth by late June. If you continue to provide good growing conditions (85 F, high humidity, lots of fresh air and sunshine), C. schroederae will normally make a second growth that will be completed by the end of August. The plant will then rest until buds begin to form in the base of the sheath in late December. Because of the short days at this time of year, the buds grow slowly and the flowers will not open until late February or early March. Both the first and second growths will flower at the same time. When the plant is dormant from September until February, it should be watered sparingly — just enough to keep the pseudobulbs from shriveling. Overwatering the plants while they are dormant can kill the roots and shorten flower life. Fertilize the plants only when they are actively growing from March through August. Never fertilize them when they are dormant because this can sometimes lead to a toxic accumulation of salts in the pseudobulbs that can kill the plant. Fertilizer damage is often mistaken for fungal or bacterial rot, which it closely resembles. Cattleya schroederae is one of the most rewarding of the Cattleya species to grow because it will stay in flower five or six weeks if kept cool (55 F) and dry. Like all of the Cattleya species, C. schroederae produces the best growths at 85 F with lots of sunshine and moving air. A thorough watering should be given when it is actively growing, but the medium should be allowed to dry out before you water it again. Cattleya schroederae seedlings are usually rapid growers and seem to reach flowering size sooner than most of the other large-flowered Cattleya species. Seedlings grow better with a night temperature of 65 F than with the usual 58 to 60 F prescribed for adult plants. — A.A. Chadwick.